This time you can choose from lots of great travel deals from all over the world with popular destinations, like the 5 nights all-inclusive vacation to Cozumel we have just found from $869 per person. If you book this offer now, you can choose from numerous travel dates from August 8 to December 22 2016. Not planning a Mexico getaway for this summer? You can also stay at the International Palms Resort and Conference Center in Orlando from $58 a night, cheap flights to Mexico and Hawaii with Alaska Airlines from $149 one way or a luxury all-inclusive trip to Riviera Maya $959 per person. Book now, your favorite might sell out in a glance! 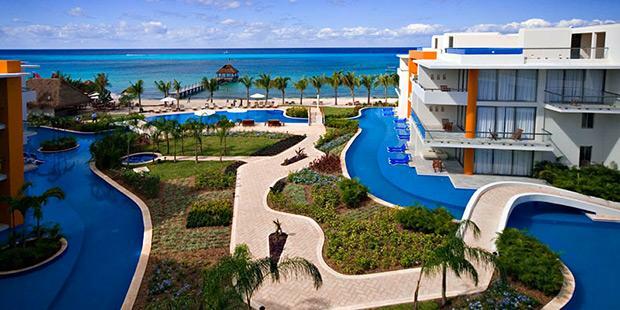 This Cozumel vacation package we have here includes 5 nights stay at the Secrets Aura Cozumel resort, round trip fight from Houston, all inclusive services throughout you stay plus all taxes. No matter how useful you find this all inclusive Cozumel vacation package, you should research the other travel sites we have below and if you like a better vacation package, grab it now! This entry was posted on Wednesday, July 13th, 2016 at 2:35 pm and is filed under Top Deals, Vacation Package Deals. You can follow any responses to this entry through the RSS 2.0 feed. You can leave a response, or trackback from your own site.